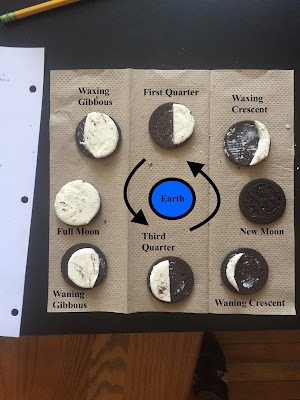 We used cookies to model the phases of the moon! 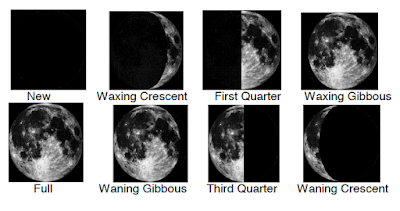 Remember that "waxing" means the moon is getting brighter and "waning" means the moon is getting darker. February is Black History Month, so it's a perfect time for us to celebrate African-American astronauts! Here is a list of some famous black astronauts. Click on their names for more information about them. Benjamin Baneker - 1st African-American Astronomer. Doctor Arthur Bertram Cuthbert Walker II - Famed solar physicist and x-ray astronomer. Chaired Challenger disaster commission. Doctor Harvey Washington Banks - 1st African-American to Receive a PhD. 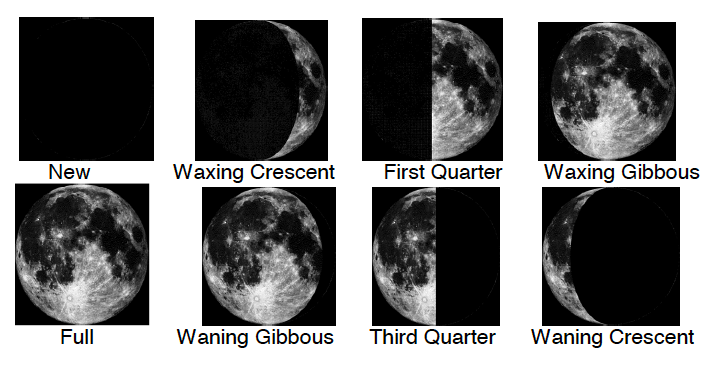 in Astronomy. Doctor Neil deGrasse Tyson - Frederick Rose Director of the Hayden Planetarium in New York City. Doctor Beth A. Brown - NASA Astrophysicist. Robert Henry Lawrence - 1st African-American Astronaut. Guion "Guy" Bluford - 1st African-American in Space. Doctor Bernard Harris, Jr. - 1st African-American to walk in space. Frederick Gregory - 1st African American to pilot a spacecraft, 1st African-American to command a spacecraft. Doctor Mae Jemison - 1st African-American Woman in space. Doctor Ronald E. McNair - Hero lost aboard Challenger. Michael P. Anderson - Hero lost aboard Columbia. This video is a great quick overview of many of the astronomers we've been studying. Give it a watch...it's the best way to spend 2:36 seconds of your studying time! 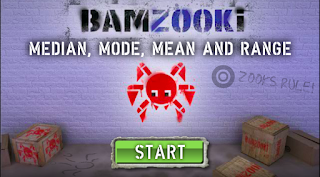 Check out this game for extra practice finding mean, median, mode, and range. 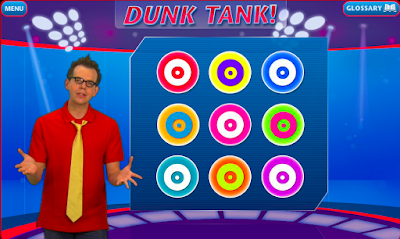 You may also want to challenge yourself placing the data sets in the game on a number line. Are you ready for another action-packed week!? I hope so, because our calendar is brimming with fun over the next few days! You will have homework Monday and Tuesday evening to complete. Be sure to finish your two Compass Learning choices and your Google Classroom Journal by Friday. 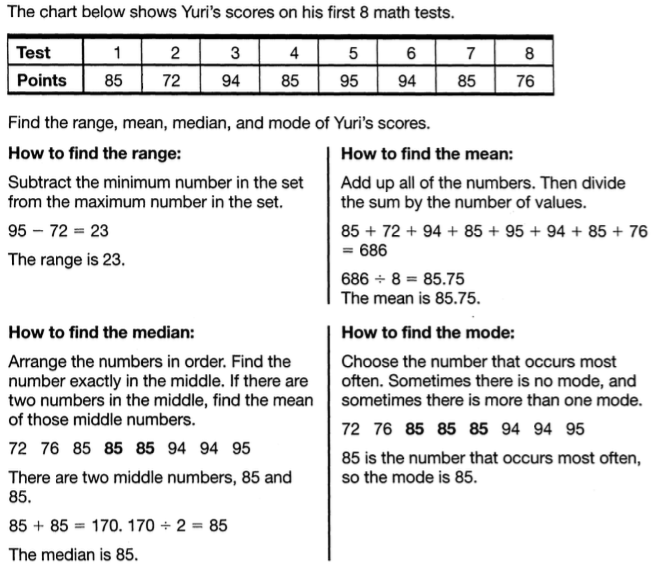 All of these assignments will get you prepared for a quiz Thursday on graphing measures of central tendency. Math tutorial will take place Monday and Wednesday from 3:15-4:00. Our science studies will continue to be focusing on famous astronomers in history. 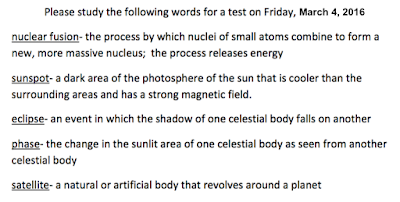 Use your study guide to help you prepare for Friday's test. Your "Planetary Pathways" choice sheet a great way to guide your research. 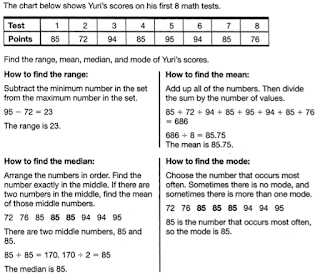 Please complete three choices from the sheet by Friday. It's also PTA Science week at Ellis! Our PTA has organized a number of guest speakers to come into our classroom and talk about careers in science. Let's give these visiting scientists a big Charles Ellis welcome! This Friday is "Dress as your Favorite Montessori Material Day"! I have a few ideas in mind...perhaps will I be a golden bead or a fraction piece. Maybe I'll choose to dress up like a geometric solid or even a peace rose! What are your ideas? Your bi-weekly progress reports are being sent home today (Wednesday). Please share them with your family, sign, and return them to your homeroom teacher. Please feel free to email Ms. Susan or myself if you have any questions. 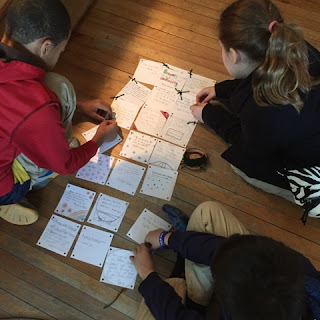 Are you planning on doing some research on constellations? 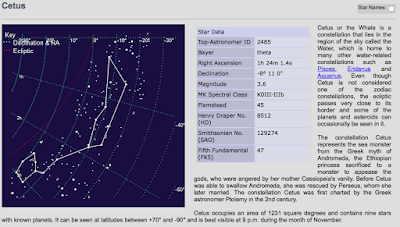 If so, consider using this resource to see information about the constellation's location, myth, and star names. Friday morning, I will staple a page listing any missing required assignments you may have. This will include classwork, homework, Compass Learning choices, and Google Classroom journals. If you are missing anything, please hand it in ASAP. If I do not give you a list, you have completed all of your required assignments so far this term. 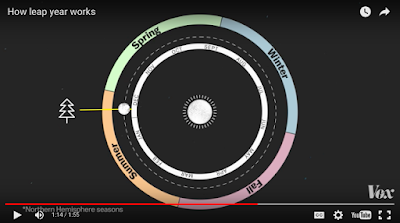 We took some time to explore the beautiful path the Earth takes around the sun every 365 days. 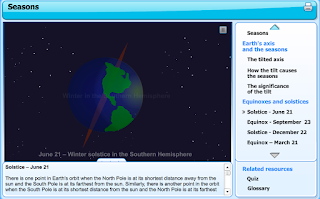 The tilt of the Earth on its axis is the reason for seasons, solstices, and equinoxes. Below is a nice interactive visual you can use to review what we've talked about. It includes a glossary of terms and a quiz you can try. This is a wonderful introduction to our studies on outer space we will begin next week! Our grace and courtesy focus this week is about being assertive. Students researched famous quotes about being assertive, wrote them on a square, and stitched them together into an assertiveness quote quilt! It can be found hanging next to our peace cabinet. It's fun to share kind words with friends to let them know how much we value their friendship. 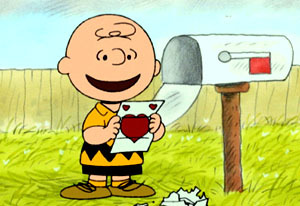 Let's celebrate our friends with a Valentine exchange! Monday you will receive a homeroom roster. You are invited to make valentines that will be exchanged with your classmates this Friday! If you choose to participate, please prepare a valentine for all of your homeroom classmates. The second week of February is shaping up to be a great one! Our math studies will once again focus on volume of prisms. This week we will take a look at triangular prisms. Here is a wonderful resource you can use to practice this skill. - Tutorial Monday and Wednesday from 3:15-4:00 (Tutorial has been canceled this week). You have another week to explore weather patterns! Use your Meteorology Matrix choice sheet to guide your research. Three choices are due Friday. 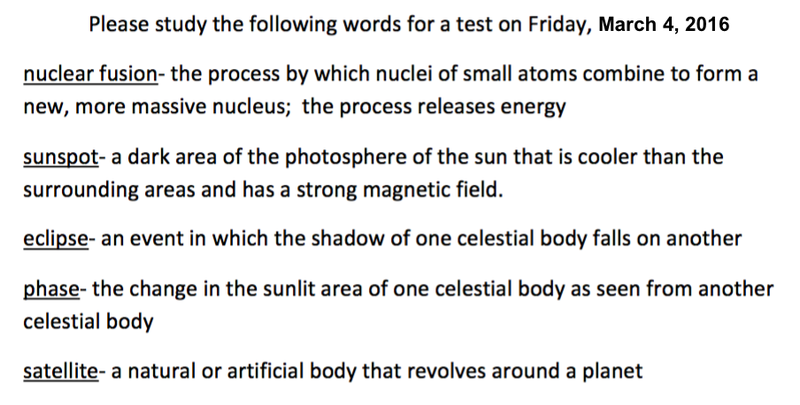 The best way to prepare for Friday’s science test is to use your study guide for help. Also, don’t forget about all the great weather books and materials on the science shelf…they are a treasure of great information! Finally, don’t forget that Friday is a dress down day for $1. All proceeds will go towards the Susan G. Komen Foundation for cancer research. Yesterday’s storms gave us a chance to get an up-close-and-personal look at our current topic of study in science: severe weather! 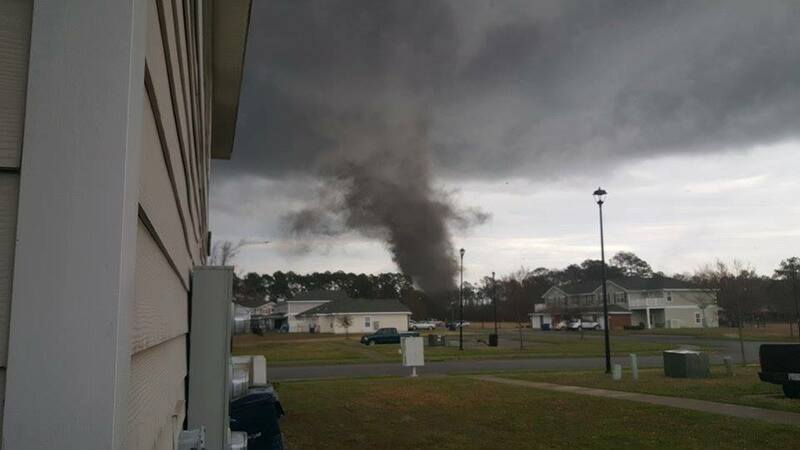 The tornado that ripped through Fort Stewart was spawned by a cold front that raced through our region. Today, we had a change to compare recent temperature and barometric pressure data (found using our LabDiscs) to see the differences in readings before and after the storm. Last evenings storms brought both a lowering of air pressure and temperature. The fact that this tornado happened right in the middle of Severe Weather Preparedness week is a sobering reminder about the need to be prepared for such occurrences. Check out the science shelf for a variety of checklists you can use to make sure you and your family are ready for future severe weather. 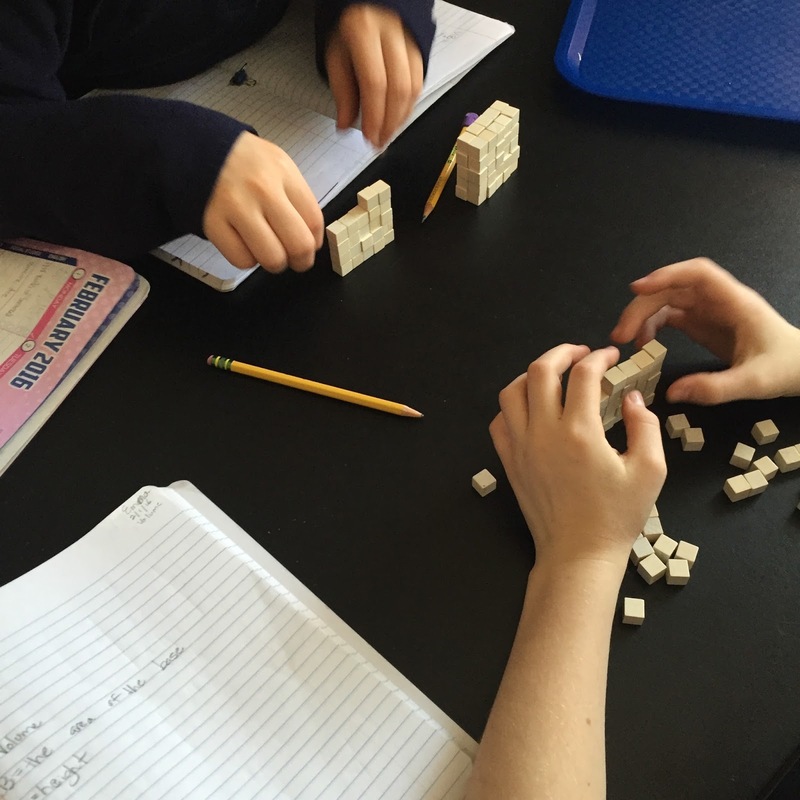 We enjoyed using centimeter cubes to construct a number of rectangular prisms. By using the cubes, we could easily discover the volume of the prisms by adding together the number of cubes we used to build each one. This is a concrete example of the definition of volume: the amount of cubic units contained in a geometric solid. Progress reports have been sent home today. Please review, sign, and return them to school as soon as possible. Please let me know if you have any questions.